We're blessed to live in such a beautiful city. While it’s easy to get caught up in a busy life, we forget there’s a whole paradise right outside our doorstep. And, walking is one of the best ways to make the most of the City of Sails. It gets you moving, gets your heart rate up and there are some seriously stunning routes at our disposal. Featuring beautiful coastlines, stunning waterfalls and native bush, we promise these Auckland walks will bring you delight and feed your soul—they're also pretty good for your Instagram cred. Here are the best walks in Auckland. The cherry-blossomed lanes of Cornwall Park make this one of the city’s prettiest walks. The two-hour round trip takes you through the lush green fields of the park and up the infamous One Tree Hill. From the top of the dormant volcano, you’ll have a 360-degree view of Auckland, including up close and personal views of the Manukau Harbour to the west. Back down on flat land you can wander along the paddocks and say hello to the sheep, goats, and cows on your way. This walk has it all—beautiful flora, fauna, and hilltop scenes. If you’re lucky, the fresh fruit ice cream vans will be out and open for a fresh strawberry cone to cool you down on a hot day. Otherwise, rug up warm and opt for a winter picnic and a flask of hot chocolate under one of the many huge sheltering trees around the park. 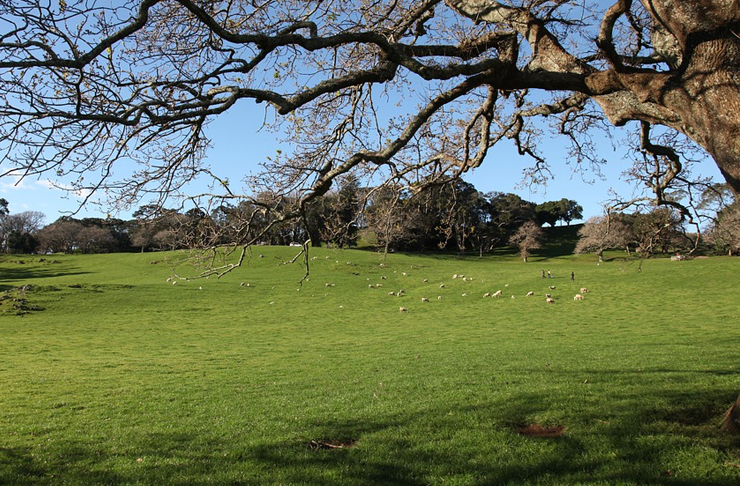 With 670 acres shared between One Tree Hill and Cornwall Park, you’ll be able to find your own private section to picnic. If you’re looking for a short and sweet walk, Western Springs is the spot. The 1.8km walk takes no longer than 30 minutes. Start at the carpark off Great North Road and take the free tram ride to the park. From there wander around the freshwater lake where you’ll see familiar native faces like the pukeko, teal, Australian coot, and shovelers. This is also the perfect spot for a lakeside picnic or BBQ using one of the park's dedicated areas. Save some old bread for the Western Springs eels—these guys grow up to two metres long and can live for up to 80 years so make sure you catch a glimpse–just don’t try fishing. Not cool. The final must-see at Western Springs is the Fukoaka Garden. This tranquil and traditional Japanese Garden has its own waterfall, pond, and tea pavilion and is free and open to the public from 10am to 5:30pm daily. If you’re not quite ready to call it a day, hit up one of Western Spring’s neighbours, the Auckland Zoo for some animal sightseeing or get hands-on with some amazing technology at MOTAT. Take a stroll in the sun along the seven-kilometre Westhaven Marina, which begins at the Harbour Bridge end of Westhaven Drive. The wooden boardwalk parallels the harbour for seaside views of the Waitemata Harbour, Herne Bay Beach, and Cox's Bay. If you’re a sailor at heart, you’ll be able to marvel at some of the luxury yachts parked up next to the boardwalk, before heading across the pedestrian footbridge that overhangs the motorway. The huge panels that have been implemented along the footpath work amazingly at blocking out the roaring motorway traffic and keep the walk peaceful and serene. If you’re heading to Westhaven in summer you’ll be greeted with blossoms of red pohutakawa in trees and coating the footpath. The walk finishes at Point Erin Park. From here you have the choice of heading to Point Erin Pools for a quick dip to cool down, or hit one of the great cafes in the area, before heading through Victoria Park to Albert Street and through the Auckland Viaduct and Wynyard Quarter to complete the loop. 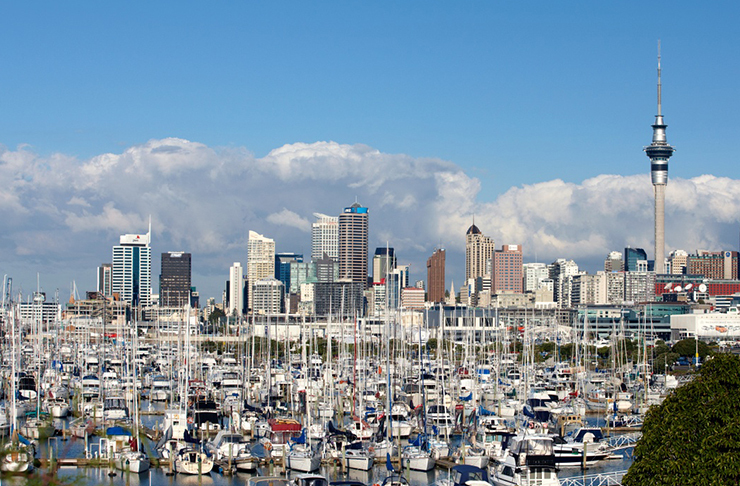 Looking to brush up on your Auckland knowledge? Look no further than the Takapuna-Milford Heritage Walk. The Auckland walk starts at the Takapuna boat ramp and finishes at Muritai Road near Milford Beach, taking a minimum of two hours. Download this map from the Auckland Council and follow each keypoint explained. Begin with the first marked spot on the map, the Pohutakawa and The Mon Desir. From there, you’ll be taken through different historical landmarks of the North Shore, including the old post office, White Oaks, Hurstmere Homestead, Algie’s Castle, Mirror House, Firth Cottage, the Giant’s Chair, and the Fossil Forest. The walk is packed with interesting facts and real-life artefacts to marvel at. What could be better than a self-led Auckland heritage walking tour? See the entirety of Auckland on foot. The North Shore coastal walkway takes you all the way from Long Bay to Devonport in a six to seven-hour walk. With stops at Torbay, Browns Bay, Rothesay Bay, Murrays Bay, Mairangi Bay, Campbells Bay, Castor Bay, Milford, and Takapuna, you can tailor the length of the walk to your liking. Make it a light and easy jog or a full day of walking. 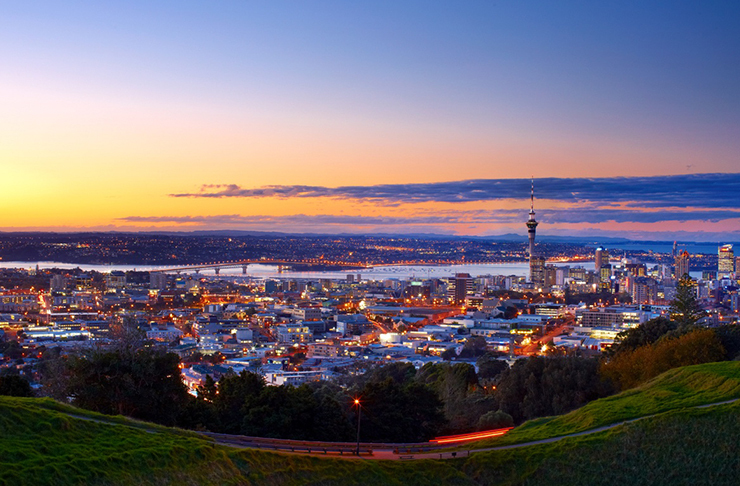 Along the way you’ll see sights such as the North Shore City cliff tops, stretching blue views of the Hauraki Gulf, and a panoramic perspective of the Auckland City skyline. The walk will take you right up to the water’s edge, onto the beach, through JF Kennedy Memorial Park, and through a boardwalked bush. Keep your eyes peeled for any signs of dolphins in the gulf for an extra special sightseeing addition your Auckland walk. Nestled into the bend of the Manukau Harbour is Ambury Park Farm, a farmland of sheep, pukeko, goats, cows, pigs, chickens, rabbits, turkeys, and peacocks—a perfect Auckland walk for animal lovers. Ambury Park Farm is the best place to get back to your farming New Zealand roots and breathe some fresh air into your soul and lungs. The walk is more of a wander. Pick your own pace and track. Trek through the paddocks to greet every type of farm animal, but just stay respectful during lambing season or their daily milking or, head down to the coastline and walk along the water’s edge. There are BBQ’s, drinking fountains, bathrooms, live shearing sessions, and picnic tables on site, so you can set up camp for a full day of farm life. This Auckland walk begins at the white-sand beach of Narrow Neck. The water is great for swimming, with picnic spots dotted along the seaside. Stretch your legs after a swim or picnic feast and tackle the Narrow Neck to Devonport walk. The walk is low-tide dependable as you’ll be on the beach for a fair bit, but the variety of steep paths, steps, and terrains makes for an interesting and engaging walk. Views of Rangitoto, Hauraki Gulf and Auckland City can be seen along the path. You'll also see other historical spots around Devonport such as the military installations and the classic Victorian-styled houses. Grab a coffee at one of the many great coffee shops along the path, or at the final destination in Devonport. Perfect for a leisurely Sunday morning stroll, and a great excuse for a Devonport ferry trip. Catch a train from Britomart and you’ll be at Orakei Basin in no time. The basin evolved from a volcanic eruption 85,000 years ago, leaving a tidal lagoon in its place. Circumnavigate the huge body of water via the 2.8km long boardwalk and escape from the hustle and bustle of the close-by city centre. If you want to extend your walk, take the long route along Upland Road and through Meadowbank before merging your path back to the basin’s boardwalk. The natural beauty of the Orakei Basin walk comes from the still, blue water and lush green bush walk on the southern side. The boardwalk will get you close to the water (try your hand at paddle boarding on a calm day) and talk you alongside the train tracks for an adrenaline rush. Reward yourself with a healthy and delicious treat from Bowl & Arrow or Bird On A Wire after to nourish your body for all the hard work. Ever wanted to attempt to cross the width of the country by foot in one day? This walk does just that. The coast to coast walkway is 16km long and will take around four hours depending on your pace and any stops along the way. Start at either end and the urban walk will link you between Waitemata Harbour and Manukau Harbour. 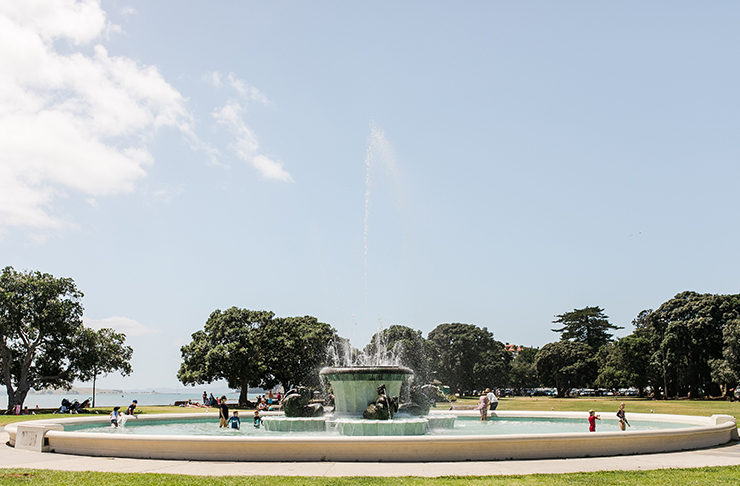 Along the way, you’ll visit the Auckland Domain, Albert Park, New Market shops, Mt Eden Domain, Cornwall Park, and One Tree Hill. Plus, you’ll gain bragging rights of crossing the entire city by foot in such a short amount of time. Keep your eyes peeled for creatures such as the fantail, kingfishers, and tuis among the trees. If you’re feeling peckish or in need of a pit stop, there’s plenty of spots to stop for a coffee or bite to eat, as well as sunny spots to have a quick rest before tackling the next part of the walk. Once you’ve reached the opposite coast, take in everything you’ve accomplished and catch a bus or train back to your starting point. Congratulations, you’ve just walked coast to coast. It doesn’t get more Auckland than Tamaki Drive. Connecting St Heliers to Quay Street, the road stretches eight kilometres along the Waitemata Harbour. The flat walkway is a shared footpath and rollerskaing/bikeway, so take your pick of transportation. The featured landmarks and destinations along the way include Okahu Bay Reserve, Orakei Domain, Bastion Point, Michael Joseph Savage Memorial, Mission Bay Beach, Kohimarama Beach, and St Heliers Bay and Beach Reserve. The walk gets you out and about in the city, with hundreds of smiling faces and furry friends to greet along the way. Start from either end and plan time for a stop at one of the many white sand beaches along the way. Take a dip or just relax under one of the shady pohutakawa trees. It goes without saying that Mission Bay is known for their delicious and abundant eateries, so it’s the perfect place to have a bite to eat midway before the second half of the walk. Choose from Mexican, Italian, American, Indian, and everything in between. The walk all up takes around two hours, but you can definitely adjust the time if you’re looking for a great run path or a leisurely slow with plenty of pit stops. It is certainly one of the best walks in Auckland. Strap your backpack on, the Rangitoto Island Summit Walk is a must-do in Auckland. The view from the top is like nothing you can find back on the Auckland mainland. After a quick ferry ride and moderate-hard one-hour climb, you’ll be rewarded with an 850ft high panoramic view of Auckland to the west, and an extending view of deep-blue Pacific Ocean to the east. Once you’ve reached the summit, explore some of the alternative paths on your way back down. The lava caves will add half an hour onto your walk, and will lead you through tunnels and caves of the volcano—just remember your torch. Rangitoto is undeniably beautiful, and we want to keep it that way. The island is pest-free so stick to the designated tracks and never leave your rubbish on the island. Elevate your beach walk experience by visiting one of Auckland’s most beautiful white-sand beaches in Tawharanui. The regional park has lots of different walks for you to take, some taking less than an hour and some going a little more than three hours. No matter which walk you take, the sights are as beautiful as each other. The walking tracks at Tawharanui Regional Park don’t just stop at a nice stroll along the beach. Their many walking tracks have a lookout point that showcases picturesque views of the tranquil ocean as well as a chance to walk the farm animals that graze along the park freely. For those who want something less sandy and beachy, you can also take a walk in the forests to really get in touch with nature. Prefer to be on wheels? Here are the best places to cycle in Auckland.